Fall Ring Game 2003 Ahhh! What Ring Gamer playing at the time will ever be able to forget the great White Hand Hoard of Fall 2003? Or... were they so great? Or were they more like ineffectual? Hard to say, really. But they were a big hoard, that's for sure. The plan had been in the works for over a year; give Saruman an army to rival Sauron's. The result was that every fourth player in the game was a White Hand Orc (or WHO for short) for a total of 57 un-named ones to accompany the three named. I myself was lucky enough to play Lugdush the lieutenant, giving me a couple extra points. 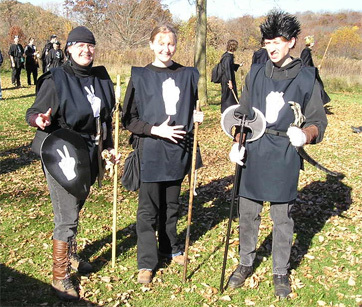 And thus it was that Saruman (played by Ring Game regular Chuck) and the White Hand were a team unto themselves. To quote an unknown WHO at the start of the game; "Can we all fit on the Isengard bridge?!" Somewhere along the line, I had gotten my first idea for a gag costume; White Hand Rock, Paper, Scissors. All I needed was two other people to go along with me and I found them in Carolyn Hays and Craig Chaimberlin. Three tabards and a lot of black clothing later, we were good to go. I left Carolyn and Craig to their own devices for armor and weapons and in the meantime I repainted my Moria Shield from Second Age Game and proceeded to sew lots and lots of metal washers onto a hat as scale mail (which I promptly got no points for, as I recall... *sigh...*). The day started somewhat inauspiciously. Craig and I had both camped out the night before, so we were in the park already. Carolyn had chosen to take the caravan from Memorial Union in Madison. It wasn't until the second half of costume judging time that Carolyn finally made it and Craig and I had been entertaining ways of salvaging the gag costumes (as I was Scissors and he was Rock, we had settled on "War and Peace" just as Carolyn got there). Several other issues occurred during the game. For one thing, our Trolls failed to catch Aragorn as he was fleeing Bree, despite the fact that she (yes, Aragorn was played by none other than my buddy Caroline "Cap" Hardin) had BLUE HAIR and was GANDALF'S ROOMATE!!! Rather than grill her for Good Team plan information, they killed her and had her sit for fifteen minutes. Second thing was that despite a very fast march from Isengard to the Shire-Rivendell path (18 minutes for 62 hikers! 57 WHOs, 3 named WHOs, Saruman, and a very put-upon Red Eye Orc kid. 62 people!! Through the woods!! ), we failed to cut off the Hobbits and catch any of them. No Ring for Saruman, so it became a crap-shoot on Mount Doom. Once Mount Doom came around, the group of fellow WHOs I found myself with decided to mess with the Red Eye faction of the Evil Team, just for something to do. So, we went around the Doom perimeter and killed them. Then, along comes Gandalf ("the pink" played by Megan Fellows), Aragorn, and the entire Good Army, rattling noise makers to mute the Mouth of Sauron. They kill us and that leaves them with no one in the way to stop them from getting up Mount Doom. Good Wins. Oh well. At least it wasn't yet another Sauron win. So, in the end, Saruman and the 60 WHOs were effectual in some way, just not the way we had hoped. It was still a fun day and a memorable game. Thanks to my 59 comrades-in-arms, who shall be WHOs forever! 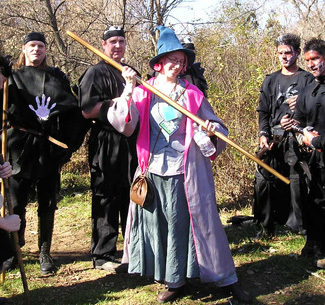 Fast Facts: Fall 2003 marked only the second game where Gandalf was played by a girl and the first where a female Gandalf was actually victorious. The previous female Gandalf (Ring Gamer Shan) played to a tie. 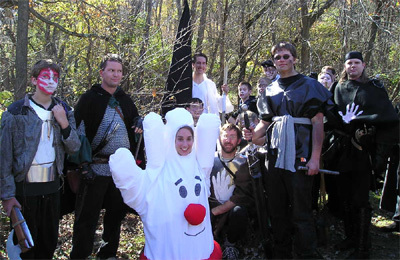 Other gag costumes included "Minister of Information Mouth of Sauron" and "Hamburger WHO-per." To the best of my knowledge, this was the largest game ever played, with the most participants ever. This Ring Game also marked the filming of Jack Barker's first music video, "The Ballad of Bilbo Baggins." To quote David Salo: "That killed some brain cells!"